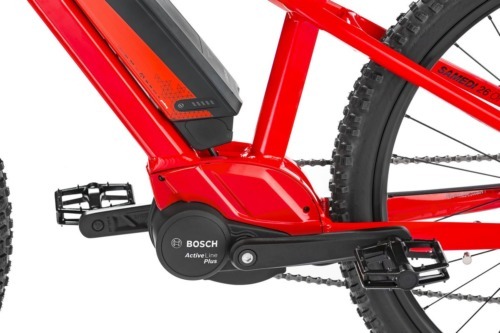 That's right - a BOSCH powered ebike for kids. Children need a boost just as much as adults in getting up grueling hills! 6061 T4 T6 alloy - variable thickness hydroformed tubes, Polished welds. Estimate your ebike battery range. Ultra compact frame allowing the youngest to access the eBike world (from approx. 1.35m size). Ideal to get started and enjoy family rides! Samedi 26 Off is energy saving! New Bosch Active Plus system, very natural, compact, lightweight and friction-less. Its low consumption provides a generous autonomy from the 300Wh battery. The Performance Line brings a mass of energy and momentum to the street, to the dirt road, to the pass, to the single trail. The powerful drive system consists of the Drive Unit Crusie (25 km/h) or Speed (45 km/h), PowerPack 300 or PowerPack 400 and the compact Charger. Intuva Active is the clever eBike control center.